Unsure of the Metri-Pack item you need? This kit contains the most common terminals and seals so you can simply match up what you have with what's in the kit. No need to buy a new harness, just replace the corroded terminal. 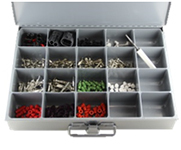 This kit contains 12 different Metri-Pack terminals and seals, 350 pieces, including 150, 280 and 480 Series. It is all contained in a small plastic box, 11"w x 6 3/4"d x 1 3/4"h. Use #PACK TOOL (not included) to crimp terminals. This kit contains Metri-Pack 150 series housings, terminals, seals, (CPA) housing tools, (TPA) wire organizers, and a removal tool. There are 697 pieces in a large metal box, 18"w x 12"d x 3"h. Use #12155975 (not included) to crimp terminals. This kit contains Metri-Pack 280 series housings, terminals, seals, (CPA) housing locks, (TPA) wire organizers, and a removal tool. There are 1011 pieces in a large metal box, 18"w x 12"d x 3"h. To crimp terminals 20-14 ga. use #12155975 (not included) and for 12 ga. use #12085270 (not included). This kit contains Metri-Pack 150 GT series housings, terminals, seals, cavity plugs and (CPA) housing locks. There are 362 pieces in a small metal box, 13 3/8"w x 9 1/4"d x 2"h. Use #15359995 (not included) to crimp terminals. Use #12094429 (not included), and #12094430 (not included) to terminals from the housings. This kit contains Metri-Pack 280 GT series housings, terminals, seals, (CPA) housing locks, and plugs. There are 362 pieces in a small metal box, 13 3/8"w x 9 1/4"d x 2"h. Use #15359995 (not included) to crimp terminals. Use release tools #12094429 and #12094430 (not included) release terminals from the housings.